Monica Prasad. 2012. The Land of Too Much: American Abundance and the Paradox of Poverty. Cambridge: Harvard University Press. 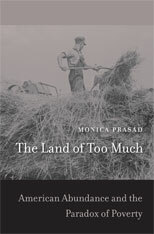 Prasad’s exciting new book, The Land of Too Much, synthesizes historical work on agrarian politics and the growing literature on American political development to formulate a novel thesis that will reorganize the discussion of comparative political economy. In doing so, she also overcomes many of the exclusions and narrow readings that sustain the debate on American exceptionalism. Prasad’s intervention starts with a deceptively simple conceptual maneuver: she abandons the scholarly obsession with welfare states in favor of an interest in the broader category of state intervention in the economy. From this perspective the United States is highly interventionist, even in comparison to European nations: “…it is clear that no country has managed to make capitalism work without heavy state intervention. Indeed, the United States is not a laissez-faire or liberal political economy at all, and it never has been (263).” With this point established, pat narratives and analytical certainties about American political development fall by the wayside. The scholarly and even the political stakes of this interpretation are high. More precisely, Prasad’s conceptual maneuver enables the construction of a new narrative of American political development and comparative political economy that connects the depression of the 1890s to the fiscal crisis of 2007-8. In this narrative, many conventional markers of American political development such as the stock market crash, Social Security, unionization, and the National Labor Relations Act fall by the wayside, while others such as the Interstate Commerce Act (1887), the ratification of the sixteenth amendment (income tax, 1913), the Banking Act (Glass-Steagall regulations, 1933), Huey Long’s Share Our Wealth campaign, the establishment of Fannie Mae (1938), and the Financial Services Modernization Act (revoking Glass-Steagall, 1999) all move to center stage. These milestones sustain a “demand-side theory” of American political development. Once we abandon European welfare states, which favored “supply-side” interventions, as the model for state intervention, the idea that the United States has a “laissez-fare” or non-interventionist approach to the economy can no longer be sustained. Instead, demand-side theory reveals an interventionist state that provides citizens access to credit rather than income support or in-kind goods such as government-managed health insurance or housing. State intervention via credit markets was not a simple policy preference rooted in a distinctively individualistic culture. It was made necessary by the unprecedented abundance of the postbellum American economy and related agrarian protest. In other words, as far as Prasad is concerned, seeing the American welfare state as insufficiently developed by European standards is not just teleological, it is based on a fundamental misunderstanding of American political economy in the 19th and early 20th centuries. The policy-making creativity that emerged in response to unprecedented economic productivity ultimately coalesced in the “purchasing power paradigm” of demand management (this term originates with the historian Meg Jacobs). In addition to access to credit, this paradigm is characterized by efforts to break up concentrations of wealth (Anti-trust legislation, progressive income taxes, inheritance taxes), which were understood to remove money from circulation and drive down prices. Once in place, these policies yielded a distinctive trajectory of state development. For example, progressive taxation tended to result in tax preferences which, in turn, encouraged the private provision of welfare benefits. The complexity and visibility of income taxes, moreover, encourage resistance to taxation which effectively places a fiscal collar on the American state. The effect of American abundance was equally consequential for the construction of European welfare states. European economies, in Prasad’s account, were simply uncompetitive in the face of American economic productivity. The response in Europe tended to be protective tariffs and limitations on consumption so that capital could be directed to productivity increases in the hope that these efforts would enable economic survival. Welfare states, in this view, are basically tools to ensure quiescence in the face of this political economic imperative. This conclusion follows naturally from Prasad’s interpretation of American political economy and policy, and it is certainly provocative. I will be interested to see if it is sustained by further research, but having recently moved to the UK I can anecdotally report that my consumption is, in fact, restrained by government fiscal policies. Prasad sets an ambitious goal for herself in constructing her account of comparative political economy and American political development. For her a successful account must be able to incorporate the reality of America’s interventionist state with an appreciation of the distinctiveness of its political economy; in addition, it must accommodate the fact that American policy intervention still yields high rates of poverty relative to other OECD nations. Prasad’s demand-side theory of state development accounts for the first two requirements. How does it account for differential poverty? This ends up being a subordinate argument in the book, but the basic claim is clear: what began as progressive interventions ended up having regressive results. While the credit economy was initially regulated to limit risk and impoverishment, it was deregulated beginning in the 1970s because there was no longer any constituency in favor of regulation. Prasad oversteps here, as she perhaps does in her interpretation of European welfare states. New regulatory measures expanding reporting and limiting the mobility of bank capital were introduced in response to a wave of neighborhood organizing in the 1970s. Looking at comparative outcomes in the wake of the 2007-8 financial crisis, Prasad sees an unregulated credit-based economy on one hand and unregulated production-based economies on the other with the former, the US, being the epicenter of the financial crises and rapidly expanding inequalities. More broadly, credit-based social provision requires a certain minimum level of income and assets to actually be helpful. In short, more poverty is baked into the American political economic cake than in nations where consumption is limited but welfare provision is more expansive. Prasad’s is an extraordinarily ambitious work that attempts to reorganize the way we think about comparative political economy over the last 120 years. Her ability to do this in a relatively slim package is a testament to her scholarship. She is highly logical in her argumentation, emphasizes parsimony in explanation, and never gets distracted by alternative explanations. Where political sociologists are complicated, she turns to economists or historians to get to the crux of the issue and arbitrate the question efficiently. But these virtues come with many costs that make the account seem incomplete. For example, whether the discussion was one between members of the Farmers’ Alliance in 1893 or between Friedrich Hayek and John Maynard Keynes, credit is not usually discussed as a policy issue more or less divorced from questions of money and interest, and yet Prasad’s account hardly deals with either at all. It appears as a contextual issue on occasion, but never as a component of a political economic logic. But if the basis of the American interventionist state is the availability of credit, talking about legislative measures without discussing how they fit with policies towards money and interest is like talking about wages but not benefits and taxes in a discussion of income. While Prasad establishes her primary point: the American state was highly interventionist, we have only learned half the story. Similarly, Prasad’s account of a consumption-based economy emphasizes policy and politics. This is not surprising given that most of the scholars who work on the welfare state and American political development are primarily concerned with politics and policy. But what happens, for example, when you have a consumption-based political economy that is unable to produce competitively (and to build on the prior point, why do you choose a monetary policy that privileges one over the other)? How is consumption financed? We used to call this sort of thing a “contradiction.” Can demand-side theory be developed in order to incorporate developments that are internal to the institutions governing the economy? Probably, but ultimately demand-side theory will have to be assessed on its ability to give a political economic as well as a political account of itself. Prasad’s book has merits that more than outweigh these shortcomings. It is based on elements of American political development and political economy that have been overlooked for too long, it utilizes comparisons along elegant axes of distinction, and it synthesizes much recent research on credit and American political development. However, its greatest merit might be the generative nature of her argument. Land of Too Much offers a compelling thesis that will re-energize comparative political economy while offering a better account of recent developments. This work will occupy economic, comparative-historical, and political sociologists for some time to come. An earlier version of this review was originally published in Accounts, the newsletter of the economic sociology section of the American Sociological Association. My thanks to Vicki Smith for inviting the review.